You want more customers. But getting more customers starts with getting in front of more consumers. To do so, you need to understand the journey consumers take when when buying your types of products and services. We use a funnel to illustrate these steps. At the top of the funnel, consumers look for your products and services online. 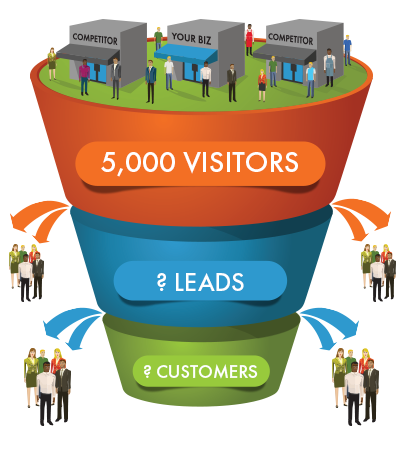 Some of them find your business and move to the middle section of the funnel where they visit your website and contact you. Even fewer get to the bottom section where they choose to become your customer. 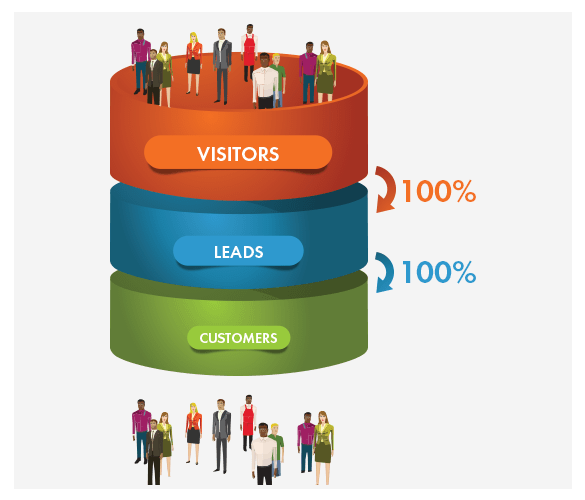 It would look more like a cylinder where every consumer would find you online, visit your website, contact you, and become a customer. Unfortunately, there’s no such thing as a perfect world. In reality, only some prospects will turn into customers. But why not make sure that all those who are interested in doing business with you, do? By identifying and fixing leaks in your sales funnel, you can. "Throwing Away Time and Money?" Yeah... I Can Afford That." Time and money. No business owner or manager would be OK with wasting either. But we’ve seen it happen time and time again. Businesses don’t show up in search results, go silent on social media sites, leave phone numbers off websites (or don’t have a website at all), don’t answer phone calls, and inexplicably don’t follow up with hot leads. These all create giant leaks in their sales funnel. However, even minor fixes and changes can make a significant impact on the bottom line. Want to see just how much small improvements can improve yours? Try out the Marketing Math Calculator today to see the difference fixing leaks in your sales funnel can make.